September 11-13 -Resonant Forms, a weekend-long series of performances featuring Simon Scott, Bethan Parkes, Lawrence English, Allesandro Cortini, Raquel Gutiérrez with Adam Garcia, Nikki Darling, Sebastian Hernandez, Patricio Morales, and Rafa Esparza, among others. In collaboration with VOLUME–schedule to be posted shortly. 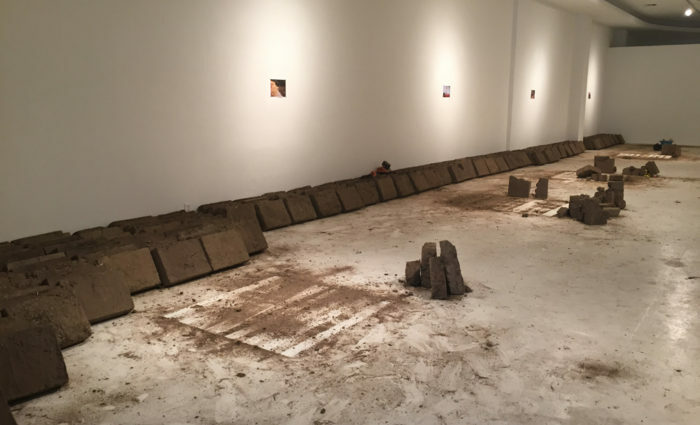 For his summer residency at LACE, Los Angeles based artist Rafa Esparza transforms the architecture of the gallery into a space absent of corners, unified by curve, and made out of brown matter in which an idea, a movement, a conversation can take form. With the help of his father and extended family members, Esparza will produce 5,000 adobe bricks that will be transported to LACE and used to build an elliptical adobe structure over several weeks. Adobe brick building has both a personal and a cultural significance to Esparza. In addition to serving as a symbol for the Esparza family work, adobe highlights a history of labor, land, and poverty. The vernacular design and available resources for adobe building evoke owner- and community-built architectural practices that use inherited knowledge and customary technologies. Prioritizing utility over aesthetics, adobe construction often reflects local environmental and cultural needs. 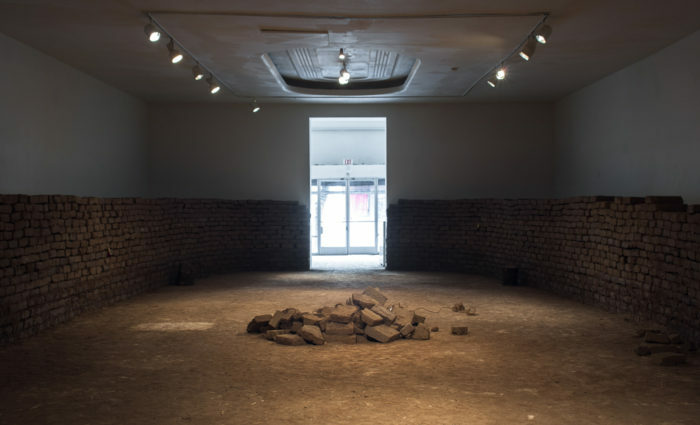 Within the project—and entering the gallery—adobe serves to question the established value systems of the exhibition space. Entitled i have never been here before, Esparza’s summer residency looks to the imagined space and renders the building process visible to the public. Adobe construction, and the communal effort that is inherent in the practice, intersects various histories and economies within the gallery. Through this meeting, the project questions the shape of power, the material and methods of representation, and the accessibility of place for certain bodies over others. Esparza and his family will begin construction on July 9 and will work during LACE gallery hours, Wed-Sun noon-6PM. Due to the flexible nature of the residency, the artist’s presence cannot be guaranteed during all gallery hours. After its completion, the adobe structure at LACE will serve as a platform for performance works by Rafa Esparza and invited artists. Read the L.A. Times article about Rafa’s project here. Rafa Esparza is a multidisciplinary artist who was born, raised, and is currently living in Los Angeles. Woven into Esparza’s bodies of work are his interests in history, personal narratives, and kinship. He is inspired by his own relationship to colonization and the disrupted genealogies that come forth as a result. Using live performance as his main form of inquiry, Esparza employs site-specificity, materiality, memory and (non)documentation as primary tools to interrogate and critique ideologies, power structures and binaries that problematize the “survival” process of historicized narratives and the environments wherein people are left to navigate and socialize. 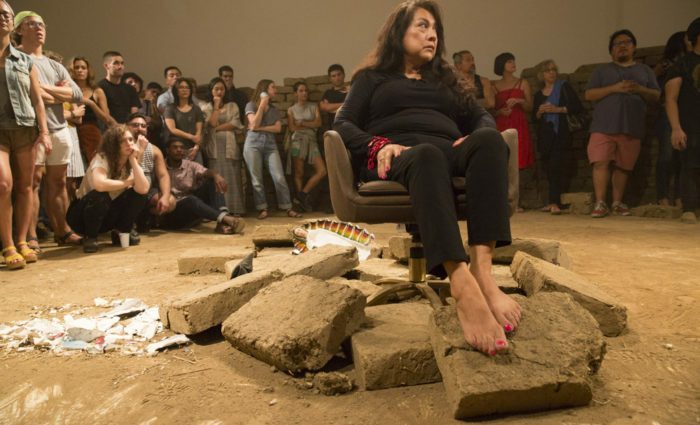 Esparza has performed in a variety of spaces including AIDS Project Los Angeles, Highways Performance Space, REDCAT, Human Resources, SOMArts, Vincent Price Museum, LACE and various public sites throughout Los Angeles. He is a recipient of an Emerging Artist 2014 California Community Foundation Fellowship for Visual Artists, a 2014 Art Matters grantee, and a 2015 recipient of a Rema Hort Mann Foundation Emerging Artist Grant. Read more about Rafa Esparza’s work on KCET Artbound. This project is made possible by a grant from the City of Los Angeles, Department of Cultural Affairs and The Andy Warhol Foundation. 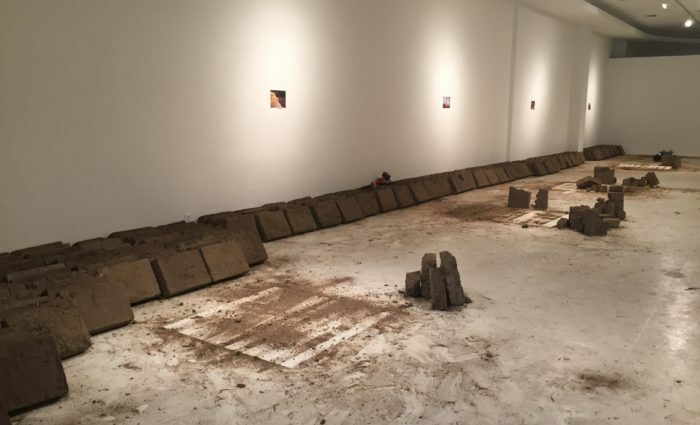 The adobe bricks that Esparza produced for this piece were made at the Bowtie Project, a collaboration between Clockshop and California State Parks. For more information about the Bowtie Project, please see www.clockshop.org/thebowtieproject.